The Seller is defined below as Artisans Angkor (Sepakor Angkor Co. Ltd), Stung Thmey Street, PO box 47, Siem Reap, Kingdom of Cambodia, its website www.artisansdangkor.com and all its shops. The Buyer is defined below as any legal person, including company, firm, association or individuals using the site www.artisansdangkor.com or using Artisans Angkor shops or dealing with Artisans Angkor Sales Department or using Artisans Angkor official resellers’ facilities and implicitly accepting these terms of sales. General conditions of sales apply to all such exclusive sales concluded by www.artisansdangkor.com or Artisans Angkor shops or official resellers or Artisans Angkor Sales Department and both for its own account and on behalf of his constituents. The information given on the website www.artisansdangkor.com, in shops, in catalogs, on photographs, in price lists or notes, etc... Are only given as an indication and can as such be altered by the Seller without notice. The mere fact of placing an order or accepting an offer or purchasing from the Seller tacitly includes the unconditional acceptance of these general conditions of sale. These general conditions of sale can be modified at any time without notice by the Seller, the changes are then applied to all subsequent orders. The Seller may occasionally need to change certain provisions of its general conditions of sale, the Seller also recommends the Buyer to reread all terms and conditions before each validation control or each purchase. When purchasing, the Buyer is fully aware that the agreement on the content of these general conditions of sale does not require physical or electronic signature of the present document, to the extent that the Buyer wishes to order the products presented in the context of the online store www.artisansdangkor.com. Or the Seller’s shops. The Buyer is deemed to accept without reservation all the provisions of these general conditions of sale. In Artisans Angkor shops and official resellers and on the website www.artisansdangkor.com, the offer is valid in the limit of stocks availability. In case of quotation, the offer will remain valid for seven days unless otherwise stipulated by Artisans Angkor’s Sales Department. English, French and Khmer are the only languages offered for the conclusion of any order and/or purchase. The essential characteristics of the products are listed in the product information, displayed nearby the product in shops or generally containing a photograph of the product and describing its features. Those essential characteristics are also available on the website www.artisansdangkor.com. The products shown on the photographs to support the text are not contractual. As all our products are entirely made by hand - and thus unique -, it is possible that some of them slightly differ from the catalog picture. On the website www.artisansdangkor.com, we take great care when putting information and essential characteristics of the products thanks to the technical descriptions emanating from us and photographs illustrating the products. The information and images contained on this site are not contractual and may contain unfortunate errors. Despite our great care of the information Artisans Angkor provides, if errors might be found, in no case, such error cannot be held against the Seller. Our raw material suppliers may change without notice the composition of the products. The Seller is entitled, at any time, to update, improve or remove from sale its products and / or peripheral products. All the Seller’s offers and its official resellers’ offers are subject to the Seller’s and its official resellers’ stock availability. In Artisans Angkor shops and its official resellers’ facilities, the product availability is limited to the current location stock availability. In case of temporary unavailability of the product in Artisans Angkor shops and official resellers’ facilities, regular orders can still be agreed between the Buyer and the Seller. In case of definitive unavailability of the ordered product, the Buyer will be informed at the earliest by the Seller or its official reseller. If an order has already been passed, and only if our services have not sent the product(s) to the carrier yet, the Buyer will be able to cancel the order and will have the option of requesting a full refund of amounts paid within 30 days with no financial interest payment by bank transfer or the option of waiting for the availability and delivery of products. 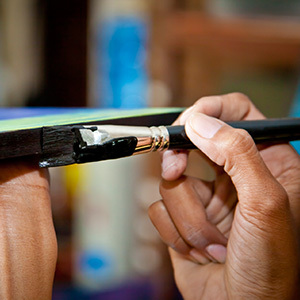 In any case of unavailability of the ordered product, Artisans Angkor Shops, Artisans Angkor Sales Department or www.artisansdangkor.com cannot automatically provide a substitute and must inform the Buyer. We undertake to inform the Buyer by e-mail within eight days and specify a timeout for receiving this product if available after placing your order. In case of partial unavailability of ordered via products Artisans Angkor shops, Artisans Angkor Sales Department or www.artisansdangkor.com, Artisans Angkor may need to split the order and send them according to their availability or, upon the Buyer written wish, all products will be sent when all other products will be available. In both case, transportation fees are to be paid by the Buyer as stipulated in Article 5 of the present document. At the first order on www.artisansdangkor.com, any new buyer will create an "account". An identifier or "login" (email address) and a password will be requested. At each validation control, you will be directed to your account via a secure connection recalling the content of your order. Your order will be permanently stored, as all various information, after the Buyer final validation. When you save the order by selecting a payment method, the sale is deemed completed. The validation of the Buyer under the order constitutes an electronic signature which has value between the parties of a handwritten signature. The website www.artisansdangkor.com reserves the right to cancel or refuse any order from a buyer with whom there is a dispute over payment of a previous order. When ordering on line at www.artisansdangkor.com, the order placed on the website www.artisansdangkor.com is automatically cancelled if the payment isn’t received within 8 calendar days. From the moment the Buyer validates his order, he/she is deemed to have knowingly accepted and without restriction these general conditions of sale, prices, volumes and quantities of products offered for sale and ordered. Confirmation and receipt of the full price. www.artisansdangkor.com recommends that the Buyer retains this information on paper or electronically. For products available in Artisans Angkor shops, as soon as the payment is made and the receipt has been issued by the Seller, no cancellation of purchase is possible. For products in display in Artisans Angkor shops which requires shipment, a down-payment shall be made on the day of the order and the balance shall be fully settled before shipment. This order will be automatically cancelled if the full payment is not fully paid on the agreed day of the shipment. The Buyer won’t be entitled of any compensation or refund of any kind. For special orders, once the down payment is paid, within 8 working days, no cancellation of the order will be accepted from the day of the initial agreement and the entire remaining amount must be paid in due time as previously agreed between the Buyer and Artisans Angkor Sales Department. The prices listed on the website, shown in Artisans Angkor shops or in official resellers’ shops and specific quotations are in US dollar (US$) or exceptionally in local currency. The selling price excludes any shipment costs and any technical costs which will be indicated before the validation of the order or the purchase unless limited promotional offers are applied. The prices shown in Artisans Angkor shops or in official resellers’ shops, on specific quotations and listed on your online order after its validation and registration on www.artisansdangkor.com are firm and final. If prices fall after the order or the purchase, the Seller cannot in any way compensate the Buyer for the difference. If prices rise, we are committed to deliver you the price set on the date of the order. All retail prices include local VAT. For purchase in the Artisans Angkor shops or in its official resellers’ shops, the full ownership transfer will be effective once the full payment will be received by the Seller and the effective delivery at the agreed destination. When ordering online at www.artisansdangkor.com, the goods to be delivered and invoiced to the Buyer shall remain the property of www.artisansdangkor.com up at full payment of the price and the effective delivery at the agreed destination. For order in Artisans Angkor shops or in official resellers’ shops, or special orders, the full ownership transfer will be effective once the full payment (reduced by the down payment(s)) will be received by the Seller and the effective delivery at the agreed destination. During the period between the delivery and the ownership transfer, risk of loss, theft or destruction and damage that may result from Buyer shall be borne by the Seller. All purchased products are to be taken by the Buyer, under his own responsibility, from Artisans Angkor Shops and official resellers’ shops. Largest items can be delivered by the Seller’s carriers under the responsibility of the carriers and their insurances or by the Buyer or his representative under the responsibility of the Buyer and his representative. All ordered products can be either taken by the Buyer or his representative under their own responsibility from Artisans Angkor main shop (Stung Thmey Street, PO Box 47, Siem Reap, Kingdom of Cambodia) from the date of their availability as communicated to the Buyer by Artisans Angkor Sales Department, or they can be delivered by the Seller’s carriers under the carriers’ responsibility. If the delivery is made by one of the Seller’s carrier, the products are delivered to the address specified by the Buyer in the order. The Buyer must verify the completeness and adequacy of information he provides at the time. The Seller’s delivery times are quoted in working days’ notice and are to be considered once the order is confirmed. A delay in delivery cannot give any right to any compensation or penalty whatsoever. The Seller encourages the Buyer to notify Artisans Angkor of any delay in delivery of more than seven days in order to allow Artisans Angkor to start an investigation with the carrier. The time of investigation can take up to three weeks (average time), depending on the carrier. If during the period of investigation, the parcel is found, it will be forwarded immediately to the Buyer’s delivery location as indicated on the order. During the investigation period, no refund or return of goods and no replacement will be made. By express agreement, any major event preventing the delivery cannot be attributed to www.artisansdangkor.com or Artisans Angkor Shops or Artisans Angkor official resellers or Artisans Angkor Sales Department. Are considered as cases of major event or exceptional events by the law lock-out, strike, work stoppage in www.artisansdangkor.com or Artisans Angkor Production or its suppliers or service providers, epidemic, war, riots, requisition, fire, flood, interruption or delay in transportation, legal or administrative measures preventing, restricting, delaying or prohibiting the manufacture or importation of goods, etc.. In such cases, the Seller is released from any liability to delivery. The Seller will timely keep cases and events listed above. In all cases, the timely delivery can only occur if the Buyer is current on its obligations to the Seller for whatever cause. Except where expressly stated otherwise, www.artisansdangkor.com or Artisans Angkor Shops or Artisans Angkor Sales Department freely chooses the carrier. www.artisansdangkor.com or Artisans Angkor Shops or Artisans Angkor official resellers or Artisans Angkor Sales Department doesn’t support the transportation risks to delivery, that is to say until physical delivery of the goods to the consignee indicated at the time of the order or his representative who accepts provided that the Buyer checks the goods upon reception and in the presence of the carrier. If necessary, the Buyer shall write on the transport or consignment all reserves observed according to the procedure below in order to engage the carrier’s responsibility. Depending of the chosen Incoterms, the risk of transportation, including loss, damage or theft, shall be supported by the Buyer if it is a professional. The Buyer must refuse delivery if the parcel or the goods are damaged or missing. In case of loss or damage, the Buyer must make accurate and detailed reservations in written on the transport waybill in the presence of the carrier’s employee (reserves like "subject to control of the content of box" has no legal value) and, if possible make clear pictures. The Buyer must then send the carrier a registered letter with acknowledgment of receipt showing the reservations within 48 hours of delivery and inform the Seller in the same delay in written joining a copy of the registered letter sent to the carrier and the insurance claim form. To help the Buyer in these efforts, please contact orders@artisansdangkor.com or Artisans Angkor Sales Department. The Seller may provide help depending of the carrier and the circumstances. Goods unconditionally accepted by the Buyer upon delivery and / or if no registered mail has been sent to the carrier within two clear days is deemed safe arrival and in its entirety. No claim can be supported and therefore www.artisansdangkor.com or Artisans Angkor Shops or Artisans Angkor Sales Department cannot be held responsible. Clearance might be done either at final destination or on the way. The carrier will handle the clearance and invoice the Buyer for payment. In case of delivery of an item at the specified delivery point, or in the country as freely indicated by the Buyer in the order, if the Buyer or his representative does not pick up the item within the carrier’s contractually agreed delays, or customs or any other entity subject to regulation specifically related to the country of delivery, the costs of care or retention of the item are under the sole responsibility of the recipient. Artisans Angkor or www.artisansdangkor.com cannot be held financially responsible for the negligence or the inability of the Buyer or his representative to retrieve the item in due time. In case of no pick up of the item by the Buyer or his representative within the time agreed or imposed by contract or by local law, the no-pick up shall be presumed final and therefore, the ownership of the item is then void and the item can be given for auction or charity. The Buyer or his representative will have no right to claim any reimbursement or any compensation of any kind from Artisans Angkor or www.artisansdangkor.com in case of no-pick up due to the Buyer or his representative or as a result to any external event once the responsibility of the carrier had ended. For any questions or problems the Buyer may encounter, please contact for assistance orders@artisansdangkor.com or Artisans Angkor Sales Department. No refund or exchange can be made once the ownership is transferred (see Article 4). Due to the demanding comprehensive quality control made by the Seller, once the ownership of the items is fully transferred no guarantee will be offered. 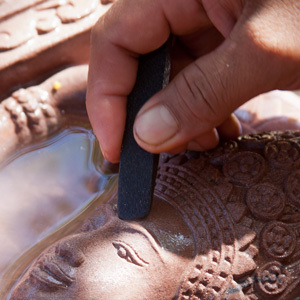 Nevertheless, depending on the circumstances, Artisans Angkor Sales Department may provide proper assistance to the Buyer if the Buyer is not fully satisfied with the purchased items. Despite the Seller’s precaution in choosing quality raw materials, the terms of this assistance won’t apply in case of raw materials natural living cycle of such materials. The terms of this assistance won’t apply in case of normal wear and tear. This won’t affect the Buyer’s customer rights. For any complaint, please contact the Seller by visiting the contact page www.artisansdangkor.com or any Artisans Angkor Shops or Artisans Angkor official resellers or Artisans Angkor Sales Department. All claims for defective goods delivered or purchased to an inaccuracy in the quantities or their erroneous references against the accepted offer or order confirmation by the Seller, must be made by registered letter with acknowledgment of receipt within 48 hours of receipt of the goods, not neglecting, if necessary and in accordance with Article 6 of the present general conditions of sale, remedies against the carrier otherwise the right to claim the Buyer ceases to be acquired. All returns require prior grant of either www.artisansdangkor.com or any Artisans Angkor Shops or Artisans Angkor Sales Department which can be obtained via the contact page www.artisansdangkor.com or upon request through Artisans Angkor Sales Department. The Buyer after obtaining the agreement of return within five days must make the return of defective goods as indicated by the Seller. The goods must be returned with a mandatory copy of the invoice. All defective products must be returned in their original packaging, included all the products and their accessories together with any documents, etc.. All incomplete returned products or/and all returned products not returned in the original packaging will not be accepted, exchanged or refunded. Expenses incurred for returning goods shall be the sole responsibility of the Buyer. Tailored products according to Buyer's specifications or custom marking, drawing, specifications cannot be returned, exchanged or refunded. No claim may be entitled to any compensation or penalty whatsoever. This will not deprive the Buyer of the legal guarantee which obliges the Seller to assist against the consequences of defects of the thing sold. In case of refund or credit of any amount, the refund will be made within 4 weeks by the Seller upon receipt of goods for whom the dispute has been duly recognized and accepted by the Seller, if the return of the item has been agreed. Failing the prior agreement, the return the goods will be done at the Buyer’s expense and risk. All costs of transportation, storage, handling will at the Buyer’s expense. No postage due returns will be accepted. This article is fully enforced by the World Trade Organization’s Agreement on Trade-Related aspects of Intellectual Property Rights (TRIPS). Even after full ownership transfer unless otherwise agreed, all designs made for special orders remain the sole property of the Seller. Those terms include all submitted designs to the Buyer and the design(s) chosen by the Buyer. The Seller disclaims all responsibility on the property which the Seller reproduces markings on behalf of the Purchaser. All added texts, additional drawings remain also the sole property of the Seller. 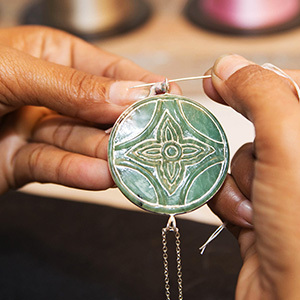 All the products sold by the Seller and its official retailers are designed, produced and/or transformed by Artisans Angkor. Even after the full ownership transfer, those intellectual properties will remain the sole property of the Seller. 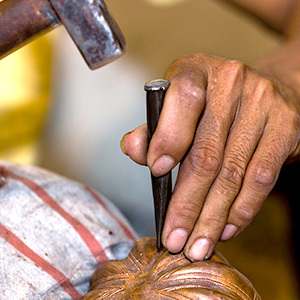 Most of Artisans Angkor products are marked by a signature or a logo protected by the Conventions mentioned above. Some of them, due to specific shapes, cannot bear Artisans Angkor distinctive trademarks and will remain the sole property of the Seller. All elements of the site www.artisansdangkor.com and all elements use for communication, promotion, demonstration, exhibition, … by the Seller whether they are visual, audio, text, layouts, illustrations, photographs, documents and other items, including the underlying technology, are protected by copyright , trademarks and patents. They are the exclusive property of the Seller and www.artisansdangkor.com. Any copy, adaptation, translation, representation or modification of all or part of those intellectual properties is strictly prohibited without the prior written consent of the Seller. Any reproduction, even partial, of those elements without written permission from the Seller is prohibited according to the international legal rules and regulations as mentioned above. When the Buyer purchases in Artisans Angkor shops or Artisans Angkor official retailers or on line www.artisansdangkor.com there will be no cooling off period after the ownership will be fully transferred (see article 4). In case of a special order, the Buyer has a cooling off period of seven days. When the seven-day period expires on a Sunday or a Cambodian bank holiday, it is extended until the first following working day. Assuming the exercise of the right of withdrawal, the Buyer has the option of requesting either a refund of monies paid or credit. This right of withdrawal is without penalty except bank charges. The right of withdrawal is only available to individuals, it does not apply in any case to any professionals. Payment can be made by cash in US$, KHR, Euros and all major international currencies – exchange costs being borne by the Buyer - or by all accepted major international debit and credit cards (with a validity of at least one month for a cash payment) in the Seller’s shops. When ordering online at www.artisansdangkor.com, payment can only be made by accepted major debit and credit cards as shown at www.artisansdangkor.com (with a validity of at least one month for a cash payment). Entering debit or credit card information is made via a secure server to ensure the security and confidentiality of information provided during the transaction banking. For special orders, the payment can be made by cash in KHR or US$ or Euros or all major international currencies or by bank transfer at the Buyer’s expense or by all major accepted debit or credit card (with a validity of at least one month for a cash payment and six months in the case of payment by installments). In the event of payment by installment, the Buyer shall return the accepted and domiciled contract within eight working days to the Seller. In case of payment settlement agreed between the Buyer and Artisans Angkor Sales Department, any settlement after the payment due date may result in billing penalties. The amount of these penalties will be equal to the statutory interest rate applied by the Sibor 1 year rate plus 10 points. Penalties are payable without any reminder. It automatically runs upon the day following the settlement date on the invoice. The legal rate of interest will also be used with an increase of 5 points for the interest payable by a person convicted by a court and has not performed within two months. The Buyer can never, on the basis of a complaint made by him, withhold all or part of the sums due by him or offsetting. Where the Buyer is in default of payment of all or part of a term to an end, the Seller may by that fact alone and without any need of prior notice, immediately suspend deliveries without the Buyer cannot claim damages from the Seller. If recourse through litigation, the Seller is entitled to claim from the Buyer the reimbursement of any kind related cost to the lawsuit. Limitations for reasons of fraud, the Seller reserves the right to accept an order to ask you to prove your identity and place of residence, and the means of payment used. In this case, the processing of the Buyer’s order will be in receipt of these documents. The Seller reserves the right to cancel the order if the Seller doesn’t receive these documents or receiving documents deemed non-compliant. The information requested from the Buyer are required to process the order when buying online and will be communicated to potential contractual partners of www.artisansdangkor.com involved in the execution of this command. Through the Seller, the Buyer expressly requests to receive commercial offers from partner companies and the Seller. If the Buyer does not wish to receive them, simply contact the Seller via Artisans Angkor Sales Department or via its contact page www.artisansdangkor.com to oppose such disclosure or to exercise your rights with regard to information about you contained in files of www.artisansdangkor.com. Regarding any data, the Buyer gave to the Seller, the Buyer can require, at any time, to rectify, complete, clarify, update or delete information about the Buyer which is inaccurate, incomplete, ambiguous, outdated or whose collection, use, disclosure or storage is prohibited. If you wish to exercise this right, simply contact Artisans Angkor Sales Department or on Artisans Angkor contact page at www.artisansdangkor.com. Any change of information for delivery cannot happen when a shipment has already started otherwise the additional costs will be at the Buyer’s expense. The Buyer knows the characteristics of internet and computer network including the possibility of interruption binding, server failures, electrical problems or others (the list is not exhaustive). Therefore, www.artisansdangkor.com cannot be held responsible for consequences of such events and will be released from any obligation to the Buyer. No claim may be entitled to any compensation or penalty whatsoever. If one or more provisions of these terms and conditions are held to be invalid or declared as such under any law, decree, regulation or following a final decision of a competent court, other provisions shall remain in full force and effect. These general conditions of sale are subject to Cambodian laws. Records and computer files of www.artisansdangkor.com will be considered by the parties as proof of communications, orders, payments and transactions between the parties, unless proven otherwise. All different on training, execution and termination of contractual obligations between the parties which cannot lead to a settlement between the 2 parties will be subject to Cambodian laws. Therefore, in case of legal dispute, only the Courts of the Kingdom of Cambodia shall be competent.